PCOS, PCOD, or P-COS, whatever you may call it, affects about 20% girls and is one of the most common hormone disorders in teenage and adult women. More and more girls now suffer from erratic periods, acne, and unwanted facial hair etc compounded by weight issues. Whether it is a trend towards cosmetic awareness or genuine menstrual problems that make them seek help, the truth is they are more aware of it as being a problem that needs to be tackled. Onset of menstruation or periods in a girl’s life heralds the change from a child to an adult. Known as menarche, the entire puberty ranges from 3-4 years during which one attains the adult height, sexual features, and eventually a normal menstrual cycle. Let us understand what encompasses ‘normal’. So a cycle interval ranging from 24-35 days span would be common to most women with a flow of 2-5 days. Any deviation from this would warrant hormonal tests and an ultrasound to look for what one calls Polycystic Ovaries. There are strict criteria for the same and just any girl presenting with irregular periods cannot be labelled such. So besides ultrasound features being present, there is the requirement of irregular prolonged menses and clinical or laboratory tests depicting an androgen excess. So why does it becomes relevant in India? Well, the basic underlying physiology in this syndrome complex is Insulin resistance or the inability of the body to utilize insulin which leads to an excess deposition of body fat, irregular periods, and increase in androgens or male hormones. India being the diabetic capital of the world obviously then has a large number of girls and women with insulin resistance and therefore childhood and adult obesity. This means, eventually, we will see more girls with weight issues and pre-diabetes and sub-fertility and in the long run they will be predisposed to get type 2 Diabetes, hypertension, and Metabolic syndrome. From a gynecologist’s point of view, who has seen this disorder across all ages, I would urge teenagers to play sports, join dance classes, organize fun outdoor activities rather than become couch potatoes, ‘social media addicts’, and play station buffs. Activity boosts metabolism and regulates weight thereby reducing fat and extra oestrogen in the body. Ideal would be any cardio for about thirty minutes five times a week. Another good habit to inculcate is to have home-cooked meals instead of food from the canteen or processed foods such as pizzas, burgers, desserts etc made from refined flour which have a high glycemic index and eventually leads to higher sugar levels. It is primarily a habit to be inculcated in the growing years. Including fiber such as fruits, vegetables, salads, oats etc should be a choice from then itself. Lifestyle changes play a huge role in regulating the issue. If however unresolved, there is a gamut of hormones one may use (tailored to the patients’ requirements) for cycle control, contraception, and fertility treatment. Unwanted hair growth too may be tackled with hormonal treatment coupled with mechanical methods of hair removal like waxing, threading, epilation, laser etc. 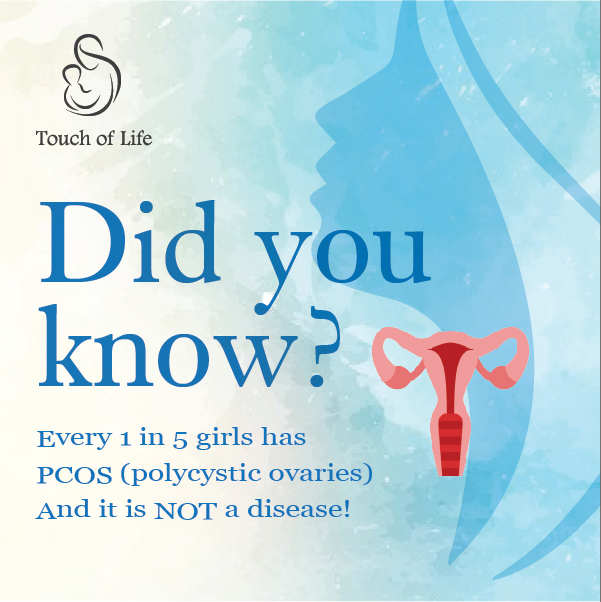 Whatever the issues may be, I want to conclude by saying that PCOS is not a disease nor does it ever go away. It is a certain body type. Once we accept it we can focus on mitigating the symptoms and problems associated with it. So get going and move it! Get your walking apps/fit bits/trainers/nutritionists and make your life healthier and ‘lighter’. The author Dr Nina Mansukhan is a Gynecologist and Obstetrician practicing in Pune. Her clinic is called Touch of Life and she is available at mansukhaninina@gmail.com and 9822321543.